4WD, dark slate gray Leather, ABS brakes, Air Conditioning, Body Color Fascias w/Bright Insert, Bright Exhaust Tip, Bright Side Roof Rails, Leather Trimmed Bucket Seats, Power 6-Way Driver Seat, Power Express Open/Close Sunroof, Quick Order Package 23G High Altitude Edition, Remote Start System, Wheels: 17 x 6.5 Granite Painted Pocket. Call Egolf Motors in Brevard at 828-884-4151 then x 1. Weve been serving customers in Western North Carolina and upstate South Carolina for over 40 years where you feel like family when you walk through the door. 20/26 City/Highway MPG Call Egolf Brevard at 828-884-4151. You make the drive, well make the deal and youll feel like family! Aside from its low price tag, there's little reason to consider the 2016 Jeep Patriot given the excellence of its competitors. The top-of-the-line Limited model has been dropped, leaving just two trim levels, Sport and Latitude. All Patriots now get Bluetooth and satellite radio as standard, while the Latitude adds automatic headlights. New options include a rearview camera and a Sport SE package that enhances the Sport with a few desirable add-ons. Comfortable front seats; optional flip-down tailgate speakers; above-average off-road capability with Freedom Drive II; attractively priced. The Jeep Patriot is among the last vestiges of the Bad Old Days at Chrysler, and yet it continues to be a surprisingly strong seller. Why? We imagine it's because the Jeep name is popular with consumers, and the Patriot is the least expensive way to put a new Jeep in your driveway, especially if you're willing to live without things like power windows and air-conditioning. The 2016 Patriot is quite affordable. But there are better options for a subcompact crossover SUV. We can't help but admire the 2016 Jeep Patriot's off-road ability when equipped with the Freedom Drive II Off-Road Group. Unfortunately, this package makes the Patriot considerably less affordable, and it also comes with the power-sapping continuously variable automatic transmission (CVT). CVTs have come a long way in the past few years, but the Patriot's has not, as it continues to rob both power and fuel economy from whichever engine it's hooked to. The upgraded 2.4-liter engine with the six-speed automatic is a more satisfying pairing, and the Patriot is one of a dwindling number of SUVs to offer a manual transmission -- but if you want the off-road ability of Freedom Drive II, you're stuck with the CVT. And if you're going to give up that off-road ability, you may as well give up on the Patriot, because the competition is roundly better. One of the alternatives we'd consider is Jeep's newest compact offering, the Renegade, which is better looking, more fun to drive, more practical and safer to boot. Yes, it's more expensive, but it's worth every penny. We'd also recommend the entry-level crossovers from other brands, including the Honda HR-V and the Mazda CX-3. If you must have a new Jeep and you're on a shoestring budget, the 2016 Jeep Patriot will fill the bill. Otherwise, this segment is full of superior crossovers, whether at the Jeep dealership or elsewhere. 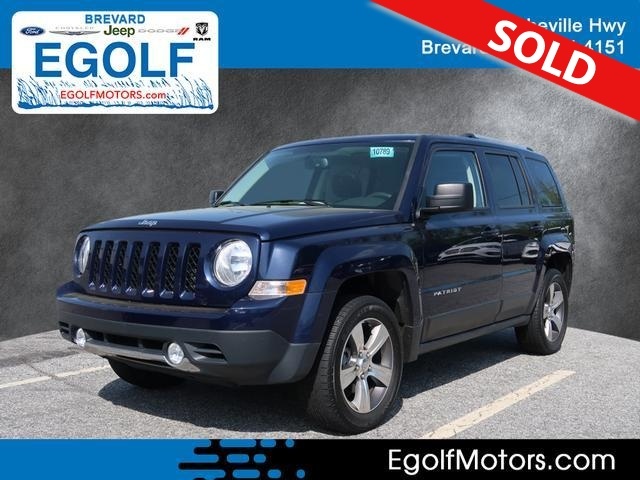 The 2016 Jeep Patriot is a five-passenger compact crossover SUV. It is available in Sport and Latitude trim levels. There are two notable sub-trims: The Sport has an appearance-related Sport SE package, while the Latitude can be had in a High Altitude Edition. The Sport has standard equipment that matches its modest price, comprising 16-inch steel wheels, roof rails, foglights, manual exterior mirrors, crank-down windows, manual locks, cruise control, cloth upholstery, tinted rear windows, a tilt-only steering wheel, a 60/40-split folding rear seat, Bluetooth connectivity and a four-speaker sound system with a CD player, satellite radio and an auxiliary audio jack. Stand-alone options for the Patriot Sport include air-conditioning, black steel or alloy wheels and an upgraded stereo with a six-CD/DVD changer. The optional Power Value Group adds upgraded exterior trim, power accessories (windows, locks and mirrors), heated mirrors, remote keyless entry and automatic headlights. The Sport SE package adds 17-inch gray alloy wheels, gloss-gray exterior trim, a leather-wrapped steering wheel with integrated audio controls, heated front seats, cloth and mesh upholstery, increased ride height for front-wheel-drive models and tow hooks for all-wheel-drive models. The Latitude comes with all of the features of the Sport with the Power Value Group, plus air-conditioning, 17-inch alloy wheels, a leather-wrapped steering wheel with integrated audio controls, a height-adjustable driver seat, heated front seats, reclining rear seatbacks and a 115-volt power outlet. A few options packages are available on the Patriot Latitude. The Premium Sound Group adds nine Boston Acoustics speakers, including two that flip down from the tailgate, and a subwoofer. The Security and Cargo Convenience Group includes a luggage cover, an alarm, remote ignition, adjustable roof-rack crossbars and an auto-dimming rearview mirror, while the Sun and Sound Group adds a sunroof and the contents of the Premium Sound Group. Finally, the High Altitude package consists of unique 17-inch alloy wheels, chrome exterior trim, a sunroof, leather upholstery and a power driver seat. Extras common to both Sport and Latitude include WiFi hotspot capability and a 6.5-inch touchscreen infotainment system with an optional rearview camera (and an optional Garmin navigation system on Latitude). A few packages are also available for both trims. The All-Weather Capability Group adds an engine-block heater, daytime running lights, 17-inch alloy wheels, tow hooks and all-season floor mats. The Trailer-tow Prep Group (2.4-liter engine only) includes a trailer wiring harness, an oil cooler and a full-size spare. The Freedom Drive II Off-Road Group (also 2.4-liter only) consists of the Trailer-tow Prep Group plus an upgraded CVT with low-range mode, skid plates, hill descent control, hill start assist, tow hooks, a height-adjustable driver seat and body sealing to allow the Patriot to ford water up to 19 inches deep. The 2016 Patriot offers a variety of powertrain configurations. The base engine is a 2.0-liter four-cylinder producing 158 horsepower and 141 pound-feet of torque, and can only be had with front-wheel drive. The uplevel engine is a 2.4-liter four-cylinder rated at 172 hp and 165 lb-ft of torque; it's available on front-wheel-drive Patriots and required with either Freedom Drive I all-wheel drive or Freedom Drive II. A five-speed manual is the default transmission for both engines. The optional automatic for the 2.0-liter Patriot is a CVT, while the 2.4-liter engine is offered with a six-speed conventional automatic. The exception to this rule is the Freedom Drive II off-road package, which combines the 2.4 with a unique CVT that features simulated low-range gearing. According to EPA estimates, the 2.0-liter Patriot returns 24 mpg combined (22 city/26 highway) with the CVT, a disappointing result given the engine's modest output. If you don't mind shifting your own gears, the manual version does slightly better at 26 mpg combined (23/30). With front-wheel drive, the 2.4-liter Patriot yields an EPA-estimated 23 mpg combined (21 city/28 highway) when paired with the six-speed automatic. The five-speed manual improves to 25 mpg combined (23/29). Adding Freedom Drive I results in 22 mpg combined (20/26) with the six-speed automatic and 24 mpg combined (22/27) with the manual. As for Freedom Drive II, it returns a dismal 21 mpg combined (20/23). In Edmunds performance testing, a Patriot with Freedom Drive I and the six-speed automatic went from zero to 60 mph in 9.4 seconds, which is comparable to a Honda HR-V (9.7 seconds) or Jeep's own Renegade 2.4 (9.4 seconds). However, a Patriot with Freedom Drive II chugged to 60 mph in 10.3 seconds, a disappointing number considering how poor the fuel economy is with this package. Properly equipped, the Patriot can tow up to 2,000 pounds. If you can live with the dismal CVT, the Patriot exhibits some off-road prowess when equipped with the Freedom Drive II package. The front-wheel-drive Sport and Latitude trims come standard with antilock brakes that include front discs and rear drums. All Patriots with Freedom Drive I or Freedom Drive II get disc brakes front and rear. Traction and stability control are standard regardless, as are front side airbags and full-length side curtain airbags. In Edmunds brake testing, the Patriot came to a stop from 60 mph in 121 feet, an average distance for this class. In government crash testing, the Patriot earned a rather alarming three-star rating for frontal impacts. There is no side-impact rating, and therefore no overall rating. More scoring comes from the Insurance Institute for Highway Safety, which gave the Patriot its highest rating of "Good" in the moderate-overlap frontal-offset, side-impact and roof strength tests, but downgraded the Patriot to the worst score of "Poor" in the small-overlap frontal-offset test. The Patriot's seat and head restraint design was rated "Good" by the IIHS for whiplash protection in rear impacts. The Patriot's interior has been tweaked over the years, but it's still one of the most basic you'll find, with cheap, hard plastics covering most surfaces and a tilt-only steering wheel that can compromise driver comfort. The Sport model is the worst offender because of its lack of standard power accessories and air-conditioning, but even the Limited's layout looks and feels more like that of an economy car than a competitive crossover. On the bright side, the front seats are pretty comfortable, providing satisfactory support for long stints in the saddle. Rear passengers won't be as pleased, however, as legroom is tight and the bottom cushion sits low, largely negating the benefits of the Latitude's reclining rear seatbacks. The Patriot's primary gauges make a good first impression with their large, easy-to-read font, and the straightforward, generally ergonomic controls are consistent with Jeep's no-nonsense heritage. The optional 6.5-inch touchscreen is outdated, though; the 8.4-inch system used in other Jeep models is vastly superior. As ever, the Patriot provides optional flip-down liftgate speakers that'll help get the party started. Lacking in room and quality, the 2016 Jeep Patriot's interior is a notable drawback. Cargo capacity is another weak spot. Although the 23 cubic feet of space behind the rear seatbacks isn't totally shameful, folding down the rear seatbacks opens up just 53.5 cubic feet of maximum stowage. For context, the Volkswagen Golf -- a compact hatchback -- provides 22.8 cubes out back and a maximum of 52.7. The Honda CR-V's capacities, meanwhile, are a whopping 37.2 and 70.9. The 2016 Jeep Patriot is painfully slow with the 2.0-liter engine, and even the 2.4-liter models move like molasses when equipped with Freedom Drive II and the soul-sucking CVT. This would be somewhat forgivable if the Patriot were great on gas. It is not. Nor is either engine refined, with the smaller one particularly troubled by the dreaded NVH trio (noise, vibration and harshness). The six-speed automatic is the Patriot's saving grace, lifting the 2.4-liter engine's performance to class-competitive levels despite sometimes slow shifts. On paved surfaces, the Patriot allows an abundance of wind and tire noise into the cabin. The trend these days is toward quietness at speed, even among value-priced vehicles, but this Jeep is a throwback. Ride quality is similarly unimpressive, as the Patriot's suspension struggles with broken pavement, making for a jittery drive over urban streets. Handling is adequate under normal circumstances, aided by the Patriot's compact footprint, but you'll notice plenty of body roll if you enter a corner with any kind of speed. As for the off-road experience, the Freedom Drive II setup moves the Patriot significantly beyond Freedom Drive I's conventional all-wheel drive -- but as noted, it's also slow and thirsty.